Follow Shylo and the Royal Rabbits in their latest adventure! 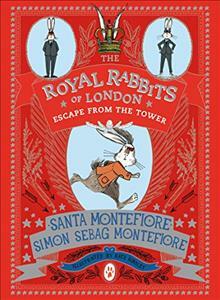 The Hobbit meets Fantastic Mr Fox meets Watership Down in this charming novel from bestselling authors Santa and Sebag Montefiore, which proves even the smallest rabbit can be the biggest hero. Santa Montefiore's books have been translated into more than twenty-five languages and have sold more than six million copies in England and Europe. She is married to writer Simon Sebag Montefiore. They live with their two children, Lily and Sasha, in London. Visit her at SantaMontefiore.co.uk. Simon Sebag Montefiore's bestselling and prize-winning books are now published in over forty-five languages. His new book The Romanovs: 1613-1918 has been universally acclaimed and is already a bestseller in the UK, Australia, and the USA where it was on the New York Times bestseller list for eight weeks. Montefiore has won literary prizes for both fiction and nonfiction. His latest novel, One Night in Winter won the Best Political Novel of the Year Prize and was longlisted for the Orwell Prize. He is now writing the third novel in this trilogy. Follow Simon on Twitter at @SimonMontefiore. For more information visit SimonSebagMontefiore.com. Kate Hindley is an illustrator who graduated from Falmouth School of Art in 2008. She lives and works in Birmingham.